Independent file photo SMSU’s Sadie Stelter dribbles around a defender during Saturday’s home matchup against Bemidji State University. The Mustangs will hit the road to face MSU Moorhead and Northern State University this weekend. 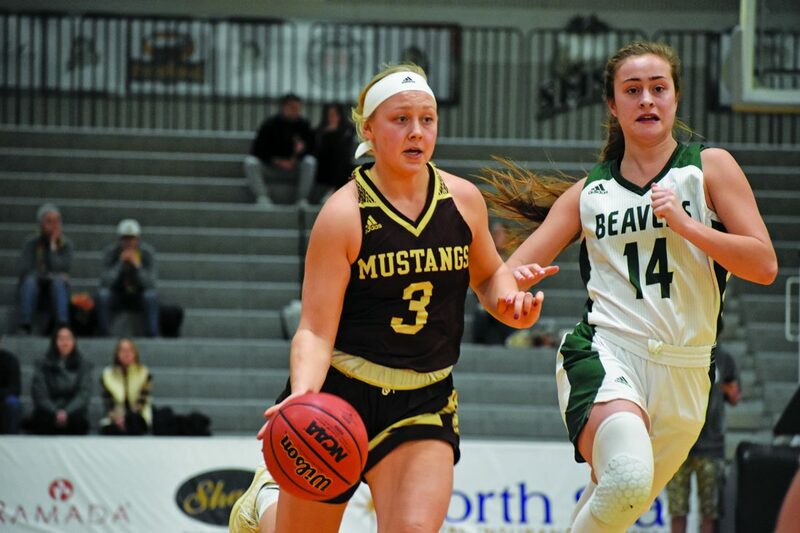 MARSHALL – The Southwest Minnesota State University women’s basketball team (11-10, 8-8 NSIC) travels to MSU Moorhead (18-4, 14-2 NSIC) on Friday at 5:30 p.m. and Northern State (8-14, 5-11 NSIC) on Saturday at 4 p.m. for a weekend battle. •Last weekend marked the 10th and 11th victories for SMSU this season. It’s the first time SMSU has earned 11 victories in a season since the 2009-10 season when they finished 15-12 overall and 9-11 in the conference. •One more victory in conference play and SMSU ties the most conference wins since then. •SMSU earned its first sweep at home since Jan. 21-22 in 2011 against Minnesota Duluth and Bemidji State. •Caleigh Rodning enters the weekend with 958 points. Rodning is on track to become the 20th Mustang to enter the 1,000-point club. •SMSU’s last four-game winning streak came during the 2009-10 season when the team won six straight. •SMSU trails the all-time series by one game at 41-40 since the first meeting in the 1973-74 season. •SMSU trails 27-14 at games played in Moorhead. •This weekend is the first meeting between the teams this season. •SMSU has lost the last six games. •The Mustangs’ last victory was on Jan. 3, 2012 in Moorhead with a 64-57 final. •SMSU trails the overall series 50-16 dating back to the 1969-70. •SMSU trails the overall record in Aberdeen, 28-4. •SMSU has lost the last five games, including a 79-62 loss in Aberdeen in the last meeting. •The last time SMSU won was on Jan. 16, 2015 with a 77-42 win in Marshall. •MSU Moorhead is 18-4 overall and14-2 in NSIC play and leads the North Division and overall just one game ahead of Minnesota Duluth. •MSUM split last weekend with a loss to Minnesota State and a victory in overtime to Concordia-St. Paul. •Sophomore guard Kiley Borowicz leads the team in scoring with 14.7 ppg. •Junior forward Megan Hintz averages a team-high 10.1 rpg. This past weekend, Hintz had her ninth double-double of the season. •Senior guard Jacky Volkert averages a team-best 4.3 apg. •Minnesota Crookston is shooting 40 percent from the field and 30 percent from the 3-point line. •MSUM is recording a plus-8.9 rebounding margin and a plus-9.1 scoring margin. •Head coach, Karla Nelson, is in her 19th season and has a 43-192 overall record. •Northern State is 8-14 overall and 5-11 in the NSIC. •NSU got swept last weekend to continue a six-game losing streak. •NSU’s last wins game in a home-sweep over BSU and UMC. •Lexi Wadsworth leads the team in scoring with 10.0 ppg. •Brianna Kusler averages 10.1 rpg for a team-high and a 2.3 apg. •Head coach, Paula Krueger, is in her first season as head coach. Krueger spent nine seasons at Colorado Mines, where she accumulated a 133-125 overall record.